Signed as a free agent August 7, 2017. 2018 (As of July 9): Played in the first preseason game against the Toronto Argonauts…Has started all four regular season games. 2017: Started six regular season games at both left and right tackle for the Edmonton Eskimos…Released by Edmonton August 7…Signed as a free agent by the Tiger-Cats August 8…Started 12 regular season games, nine times at left tackle and three times at right tackle, for the Tiger-Cats…Made his Tiger-Cats debut August 12 versus Winnipeg. 2016: Started 15 regular season games for the Edmonton Eskimos. 2015: Started 17 regular season games at left tackle for Edmonton. PLAYOFFS: Started the Western Final November 22 versus Calgary. GREY CUP: Won the 103rd Grey Cup November 29 versus Ottawa. 2014: Traded from the Toronto Argonauts May 13, along with defensive back Otha Foster, and first (6th overall) and second (6th overall) round draft picks in the 2014 CFL Draft, to the Edmonton Eskimos in exchange for first (3rd overall) and third (21st overall) round picks in the 2014 CFL Draft, and a negotiation list player…Started 13 regular season games at left tackle for the Eskimos. PLAYOFFS: Started the Western Semi-Final November 16 versus Saskatchewan…Started the Western Final November 23 at Calgary. 2013: Played in nine regular season games, starting eight times, at left tackle for the Toronto Argonauts. PLAYOFFS: Started the Eastern Final November 17 versus Hamilton. 2012: Signed as a free agent by the Toronto Argonauts July 4…Started 12 regular season games at left tackle for Toronto. PLAYOFFS: Started the Eastern Semi-Final November 11 versus Edmonton…Started the Eastern Final November 18 at Montreal. GREY CUP: Won the 100th Grey Cup November 25 versus Calgary. 2011: Signed as a free agent by the Calgary Stampeders…Appeared in five regular season games for Calgary. College: Played one season (2007) at Trinity Valley Community College…Transferred to Abilene Christian University, where he played two seasons (2008-09) for the Wildcats…Named Lone Star Conference Offensive Lineman of the Year twice…Finalist for the Gene Upshaw Award (Top lineman in Division II football). 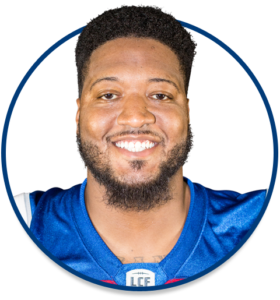 Personal: Born in New Orleans, Louisiana…Attended Alcee Fortier High School in New Orleans, Louisiana…Played one season of high school football at Alcee Fortier, earning all-league honours.